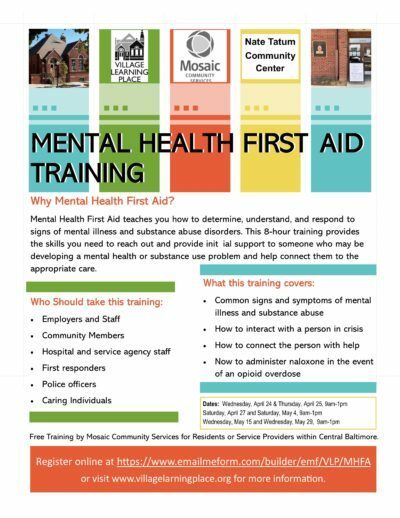 Mental Health First Aid training is free and open to the public. The course will cover how to recognize respond to signs of mental illness in others. The course is broken into two 4-hour sessions. In place of Read Between the Wines this year, we will be hosting an online auction from April 26–May 17. 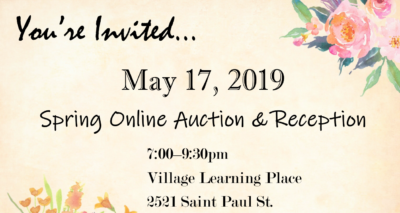 The online bidding fun will culminate in an evening reception at the Village Learning Place on Friday, May 17. 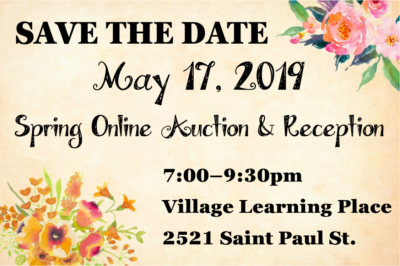 Join us for drinks and small plates to celebrate the conclusion of the Village Learning Place’s Spring Online Auction. Online bidding will launch on Friday, May 3, and close in person at the reception. Join us each week for Tots Tuesday Storytimes. This interactive story time combines books and activities to help develop language, fine motor, gross motor, and early literacy skills. En Español: Tots Martes. Unéte a nosotros cada semana para el martes de niños. Esta hora de cuentos interactiva combina libros y actividades para ayudar a desarrollar el lenguaje y las habilidades para la lectura. Todos los martes desde 10:15am to 11:15 am. 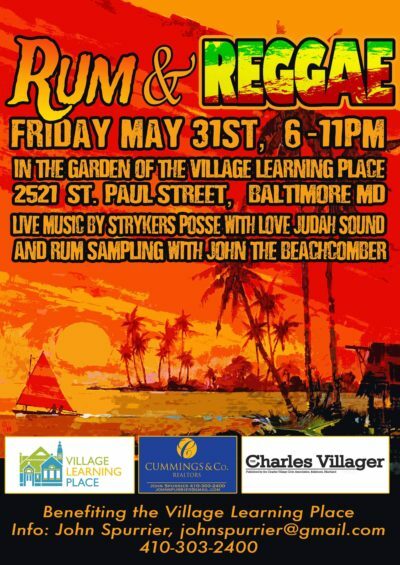 Kick off the Charles Village Festival with a beautiful night in the garden. Live music: Strykers Posse with Love Judah Sound. Rum sampling: John the Beachcomber. Mood: Don't worry about a thing. Parent's Night Out is a monthly social outing for parents in the community. It takes place on the first Thursday of each month and is organized by the Village Learning Place and the Village Parents. Light refreshments, adult beverages, and free childcare provided.